No credit needed Financing for rims, wheels and tires. No credit, bed credit - no problem. 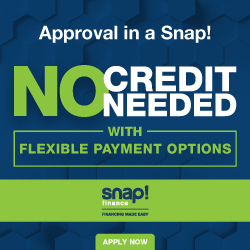 Easy Financing with Snap Finance. Click on the banner to fill out the application. Once approved call our sales hotline (323) 583-3229 to complete your order. Progressive is the no credit needed solution that lets you get the wheels and tires now and pay for the purchase over time. Get started today with the online application. If you have any questions, call us at (323( 583-3229. We look forward to fulfilling your purchase. Once you receive final approval, you can give Victoria Tire Ctr a call at 323-583-3229 or Victoria Tire will contact you to help with your purchasing.